Let’s talk briefly about what the Vue.js framework is and how we can get started using it. The Vue.js website has a lot of useful information about Vue, including the full documentation for the framework. 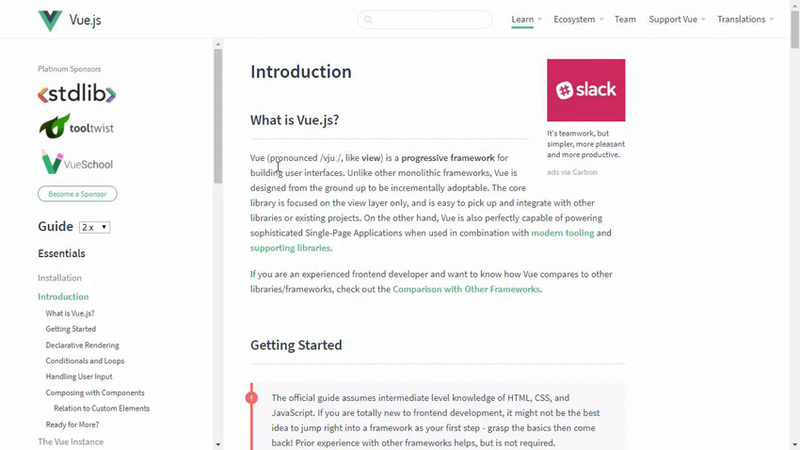 Once you get to the website, you can click on the Get Started link to see some information on what you need to do to start using Vue.js. On this getting started page, if you scroll down a little bit, you can see a script tag which has a CDN link for the Vue framework. This CDN link is what we’re going to be using in this course. There’s also a command-line interface (CLI) that you can use with Vue if you’ve got Node.js installed on your system. And that will allow you to build your own Vue projects locally using Node. Learn Vue.js with our complete Vue.js tutorial guide, whether you’re a seasoned coder or a web designer looking to pick up new front-end development techniques. In the full course, A Designer’s Introduction to Vue.js, you will learn the basics of pulling data into your web pages using Vue’s simple templating syntax. You’ll learn about text interpolation, directives, conditionals, loops, components, and more. Plus you now get unlimited downloads from the huge Envato Elements library of 490,000+ creative assets. Create with unique fonts, photos, graphics and templates, and deliver better projects faster.